The HDR-14 is a small, travel-sized AM/FM portable radio offering HD and RDS reception. 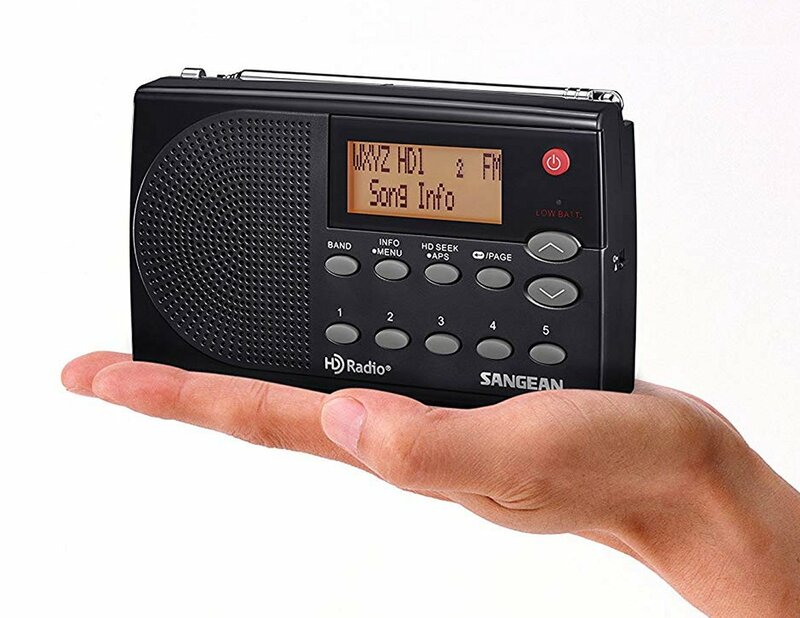 As far as I know this is the smallest radio to offer both AM and FM HD at this size and at a street price of $79.99 ($99.95 list price) is a bargain to boot. In Use: I found the HDR-14 easy to get accustomed to with all of its controls well-marked and intuitive. The display is bright and easy to read. I particularly liked the fact that there is a thumbwheel volume control…so many small radios these days have omitted that once necessary feature and replaced it with Up/Down buttons which are never as responsive as a real volume control. I suppose for everyday use it may be less of an issue but still I like the traditional control. When you turn the radio on it will indicate AM or FM Band, then the sound appears after a few seconds delay, just like its larger brother HDR-16. After entering a few stations into memory to make navigating around the bands quicker I did my usual band scans and I must say I got some unusual, and unexpected results on AM. What was unusual? 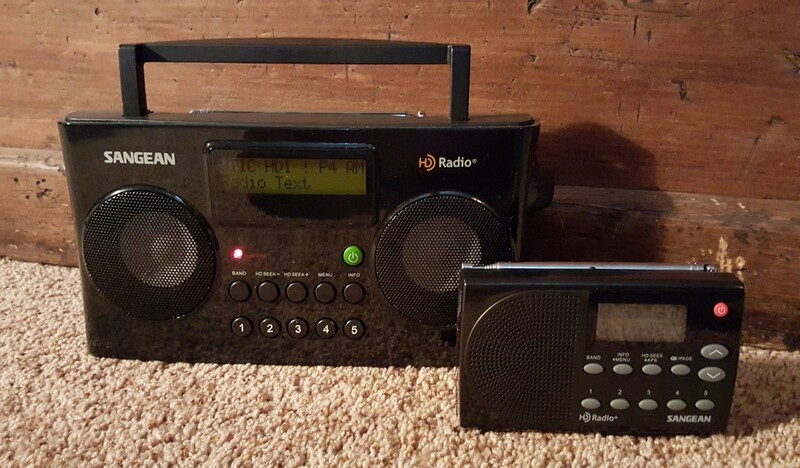 I found that although the analog (regular) AM reception was typical for this class of radio – it would rank approximately * ½ Stars in the AM Mega Shootout Article (which is OK for a compact portable), its sensitivity to AM HD signals was as good as the best HD radios I have tested. 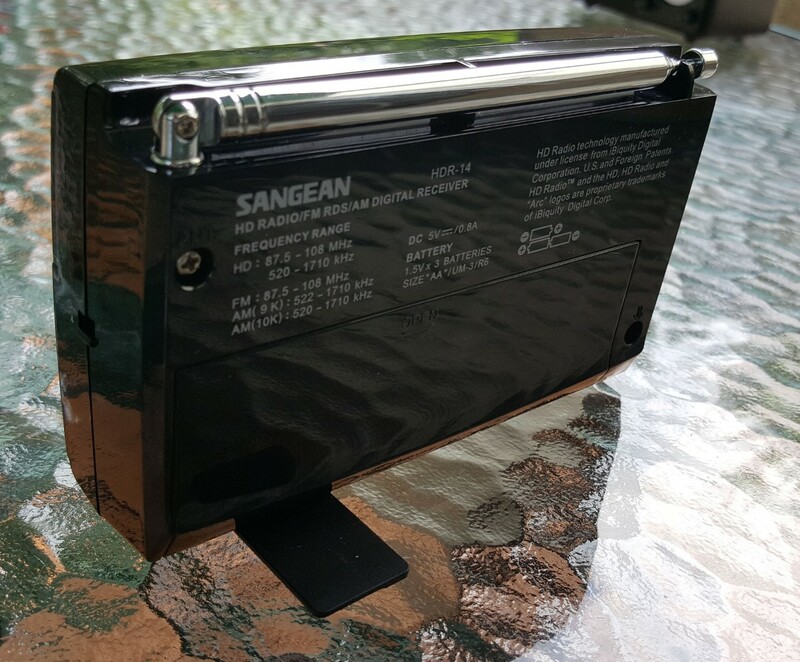 I tested it against the larger Sangean HDR-16 portable (which ranks ***1/2 in the AM Mega Shootout) and the HDR-18 Wooden Tabletop set as well as a few other HD radios and the results were repeatable and conclusive on every marginal AM signal. In analog mode the HDR-14 was much less sensitive than the HR-16, but on marginal AM signals the HDR-14 locked onto the HD signal on every station the HDR-16 did, and when a signal was barely strong enough to trigger HD (going in and out of lock) on one radio it was equally marginal on the other. I must admit I don’t yet understand what is going on here but evidently the ability to receive a clear analog signal doesn’t directly relate to the ability to lock onto the HD signal which is kind of amazing. An AM loop antenna can often push the HD into lock when you can’t get lock without it…this worked on a few out of town AM HD signals. Again, the HDR-14 was on an equal footing with the larger HDR-16 in its ability to pull in tough AM HD signals. 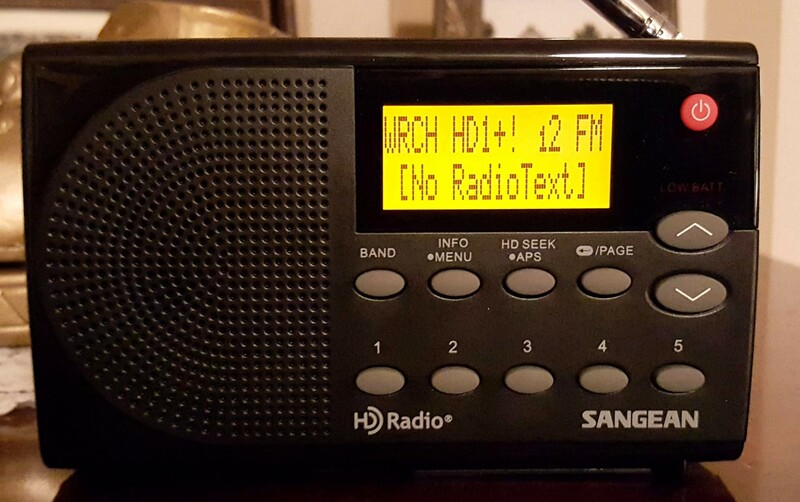 On FM the HDR-14 acquitted it self very well in both analog and HD modes, ranking 5 Stars in the FM Mega Shootout and locking easily onto every signal I could receive on the HDR-16 or my other HD radios. As I’ve remarked many times, DSP (Digital Signal Processing) has done wonders for portable FM radio reception. I also like the clever little plastic support plate that rotates outwards from the bottom of the radio to keep it from falling over…simple yet effective. Conclusion: Sangean has earned a reputation for quality which is usually above what the typical manufacturer offers today. 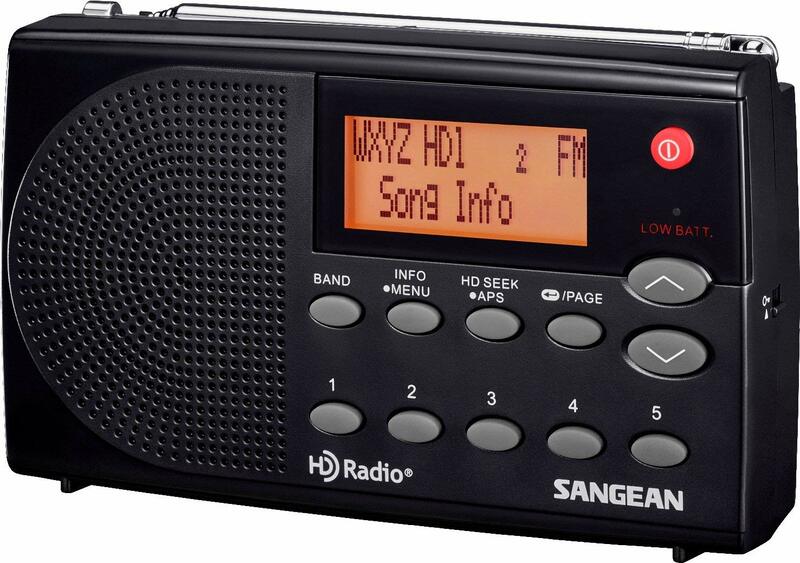 Although they have a wide range of products for very different needs and at different price points, every Sangean radio I have tested has been well-made and has stood the test of time. Its performance is exemplary for a travel-size radio, and in fact, its AM HD sensitivity is as good as it gets. FM reception is excellent in both analog and HD modes and the feature set should give you all the flexibility you might want. For all those reasons the Sangean HDR-14 warrants your serious consideration.